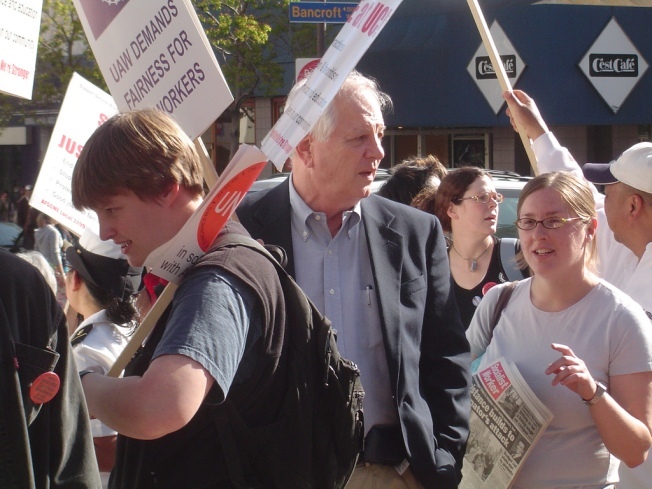 Berkeley Mayor Tom Bates, center, is no stranger to protests -- though usually he's on the popular side. Putting the "Berzerkeley" in Berkeley, neighborhood activists turned out in force to "protect" West Berkeley from green technology jobs and housing at a Planning Commission meeting last week. The East Bay Express put it succinctly: "Fifty years from now, after the polar ice caps melt and West Berkeley is under water, people might look back on 2009 and say, 'What the hell were they thinking?'" Berkeley Mayor Tom Bates has proposed easing zoning restrictions on high-rise residential development and commercial space for research and development of clean energy technology in the neighborhood that stretches from San Pablo Avenue to the Berkeley waterfront. Yet baby boomers in the neighborhood turned out in force to shout down the proposal, arguing that the plan would gentrify the neighborhood and thereby increase rents. Over the last two generations, the once-industrial neighborhood, like many in the area, has been hollowed out by the departure of manufacturing businesses and jobs. The West Berkeley Artisans and Inudstrial Companies organization, led by activist Rick Auerbach, says that area residents and business can't compete with federally funded research spinoffs from the University of California, Berkeley and Lawrence Livermore National Laboratory that are flush with stimulus money. However, the chorus of boos may fall on deaf ears among city planners, who are likely to recommend Bates's plan to the City Council. Jackson West wonders if a fund couldn't be arranged to move old hippies to Sonoma.